ComplianceOnline, the leading provider of compliance seminars, announces summit for global banking and financial services industry. "ComplianceOnline Banking Summit 2017 | Risk Management and Data Security" - Summit attendees are eligible for 16.8 CPE credits upon completion of training. 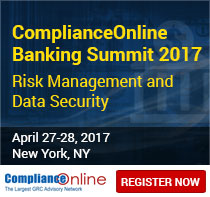 ComplianceOnline, the leading governance, risk and compliance advisory network with over 500 experts in various regulatory subjects will host a banking summit on April 27 and 28, 2017 in New York, NY. This summit brings together policy makers, regulators, banking specialists, risk managers, asset managers and supervisors to engage, debate, experience share, and deliberate the future of banking in an already connected world. Register for early bird tickets to one of the largest gatherings of banking industry experts this year. Technology has revolutionized the banking industry and significantly transformed the way banks do business. Presently banking industry is the most heavily regulated and the regulators are demanding a far greater level of insight and awareness about the risks banks manage, and the effectiveness of the controls they have in place to reduce or mitigate these risks. This banking summit will discuss numerous banking regulations and will feature key topics including risk innovation, modelling and simulation. This event gives professionals the opportunity – whether they are new entrants in the field or middle management or veterans – to interact with the leading minds in the industry about the current state of laws and technology and government oversight and more. Professionals will get CPE credits after attending workshop. New York promises to be a great location for the summit, offering world-class dining and attractions, built on a rich history and unique culture. With hundreds of daily flights to international locations, and a thriving downtown, New York will not disappoint. For more information on this summit or to get a complete list of speakers, sessions, visit the event website here.